I’m very excited about this recipe! What did you all think? Leave a link to your blog post or your thoughts on the recipe below! Our next recipe is a little wild. Stir-fried Cucumber and Pork with Golden Garlic. That’s right, cucumber! Leave any questions or comments you might have about the recipe below and we’ll try to tick through them before we cook next week! Two recipes! Was it too much? Too little? Too delicious? Leave your thoughts/links below! Congratulations to Sita who won our latest giveaway! She’ll be receiving a negi cutter, perfect for all the slicing and shredding that comes with stir-frying. Thanks to all who entered, and stay-tuned for our next giveaway. Its a two-for-one week! 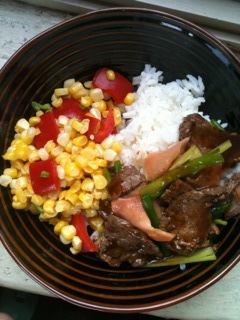 We’ll be cooking Summer Pepper Corn (p. 219) AND Ginger Beef (p.71). Both recipes should be fairly straight-forward, and it will be fun to test out our wok skills with two recipes instead of one. As usual, leave any questions or comments you might have below!